Rather a small and very special PA, than a traditional bass amp. 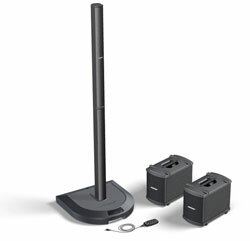 This system consists of four modules: the L1 Cylindrical Radiator Speaker, the PS1 Power Stand (with the amp and controls), a cable remote control, and the B1 Bass Module. The single bass package comes with one B1, the double bass package (which is recommended for acoustic bass) comes with two B1 modules. I recently had the chance to try this at a rehearal. A friend, a violin player, owns the Bose system PS1+L1+B1.